Bicycles and mopeds are favorite ways to get around on Block Island and enjoy its beaches, walking trails, nature and vistas. 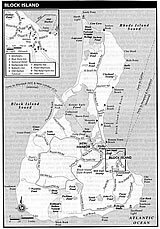 Block Island is small enough—only 7 miles (11 km) long (map)—that you can see most of it on a bike tour in one day, and even more enjoyably in two or more days. Although there are few bike paths, Block Island's roads are lightly trafficked with cars, and most drivers happily share the road with bikers. Block Island has varied topography. The highest point on the island is 211 feet (64 meters) above sea level. A few of the hills may seem longish and steep if you are not in moderately good physical condition or are not an experienced bicycler, but there's no rush! You can rest. You can walk your bike for a little while. Numerous shops rent bicycles, mopeds and motor scooters on Block Island. If you rent, most rental shops provide bike locks, but may not provide helmets. You really should wear a helmet when biking, especially on unfamiliar roads. Think carefully before you rent and ride a moped! Most visitors who rent a moped, motor scooter or motorcycle have never ridden one before. They hit the road after only the briefest of lessons from a rental shop. Thus, every summer brings a number of moped accidents with bodily injuries, a few of them serious. If you rent a two-wheeled motor vehicle, be particularly cautious, especially after the first hour or two of riding. Accidents often happen soon after you think you've mastered the vehicle and the roads. Whether you ride a bicycle or a moped, remember to use sunblock on your hands (particularly the backs), feet (especially the tops), legs, arms, neck and any other exposed areas. People not used to riding in bright sun often overlook the fact that the backs of hands and the tops of feet may be exposed to direct sun for long periods while riding, and bad sunburn may result. You could bike all over Block Island in one day if you wanted, but why rush? Various round-trip and loop rides can show you all of the island at your leisure. Here they are. 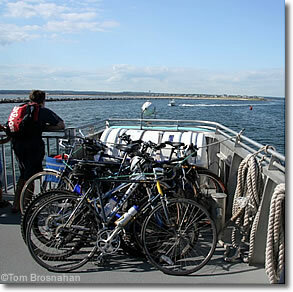 Bicycles on the ferry to Block Island: bring your own, or rent one in Old Harbor.